It was a good reminder that in this season of Lent that prayer is one of our guides; one of our markers; one of our disciplines which calls us into relationship and into life. An encounter and relationship with and in Christ leads us into prayer and calls forth our prayers. It awakens us to how God is working in our lives and how we are responding. It is about openness to the Holy Spirit and trusting in the Spirit’s promptings. Is about relationship, our communication with God and God’s communication with us. A dialogue, an openness, an honesty which is about truth, growth, healing and the depth of being a child of God. Is also about silence, the stillness and quiet which allows us to see God’s glory, mercy and graces poured into our lives. Is transforming – moving us from old ways to new ways. We pass from death into life, we make our exodus into the power of God’s love. Are moments that are “good to be here” in, as they provide us with strength to walk with confidence into our daily living – claiming our goodness. It is here that we bring Christ and the good news into our every day encounters. 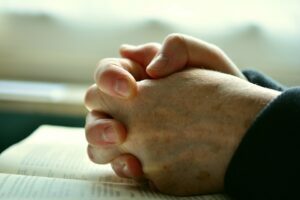 Connects us with Christ, he who prayed hears our prayers and prays in, with and for us. He, the receiver of our prayers and dwells within us – the intimacy of Christ is indeed a gift for us. He is with us here and hears our pleas. Are we open enough to trust that Christ offers us God’s will, love, mercy and graces as the answers? Reminds us that like Jesus, we too are chosen. We are chosen in Christ, a child of God – worthy, holy and beloved. In being chosen we bear Christ and our prayers call us beyond ourselves into the beautiful love-fest in which the Trinity surrounds us and calls us to life. It is here that we hold others in prayer. Prayer a key part of our nourishment, a strength; a life-line to Christ, God and the Holy Spirit. Thank you for the gift of prayer in our lives. Thank you for your Son Jesus who shows us how to pray. Thank you for the variety and beauty which is a life of prayer. Continue to stir in us and in our lives of prayer. Christ before us, Christ behind us, Christ all around us. Lenten Blessings of peace and all good!